How can we teach better quicker? 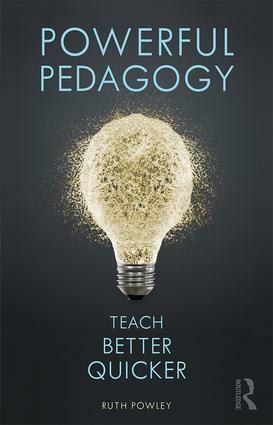 In Powerful Pedagogy, Ruth Powley, Love Learning Ideas blogger and experienced teacher and school leader, debunks teaching and learning myths and shows how the more we know about pedagogy, the more able we are to make informed and efficient choices about our practice, saving ourselves valuable time. Focusing on building sequences of learning rather than one-off lessons, it is an antidote to ‘quick fix’ books, empowering teachers as professionals in possession of ‘powerful’ pedagogical knowledge that can be used to improve teaching in a sustainable way. Effective planning of lessons and curriculum sequences. Powerful Pedagogy allows teachers to understand how to make the best choices about what works in the classroom, improving the quality of teaching. It is an essential companion for trainee and experienced teachers in all sectors, and for school leaders and educational trainers. Why don’t we know what effective teaching looks like?